Unconfirmed: MLB will name a new full-time umpire to its staff in May 2016. This umpire would replace the departed Paul Schrieber, whose contract is set to expire at the end of April. Per our umpire sabermetrics and given past hiring behavior, we predict MLB will hire John Tumpane (37%), Adam Hamari (35%), or Clint Fagan (22%). When putting together the umpire crew list for the 2016 season, MLB took care to leave two slots open to so-called full-time call-ups: AAA umpires by status who were assigned to a crew and would spend most of their time in 2016 not in Triple-A, but in the big leagues. As noted in the pre-season, one of these [Call-Up Umpire] slots accounted for Tim Welke's retirement, which will effectively occur only at the end of the 2016 season, while the other is for Paul Schrieber, who did not return to baseball in 2016. Schreiber's contract reportedly expires April 30, 2016, effectively creating a vacancy on the MLB full-time staff. 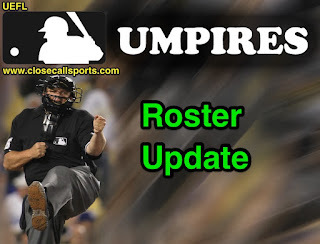 As we saw in 2015, when MLB hired Tripp Gibson, Mark Ripperger, and Will Little to the full-time staff, the Commissioner's Office selected three umpires with extensive experience during the 2014 season, including the coveted full-time [Call-Up Umpire] position. Gibson worked an MLB-leading 149 games in 2014, with Ripperger (142 games) and Little (141 gms) closely behind. The 2014 MLB umpire crews had also featured several AAA rover positions to account for retiring and Disabled List umpires whose contracts ran into and through that season. For instance, Quinn Wolcott was named as a full-time MLB umpire in early July 2014, only when DL-bound umpire Gary Darling's retirement took effect and a contract-MLBU position opened up. 1) John Tumpane - 431 Games (6 in 2010, 68 in 2011, 10 in 2012, 80 in 2013, 138 in 2014, 129 in 2015). 2) Clint Fagan - 340 Games (5 in 2011, 16 in 2012, 69 in 2013, 119 in 2014, 131 in 2015). 3) Adam Hamari - 329 Games (48 in 2013, 127 in 2014, 154 in 2015). 4) Gabe Morales - 258 Games (123 in 2014, 135 in 2015). 5) Toby Basner - 235 Games (19 in 2012, 17 in 2013, 106 in 2014, 93 in 2015). 6) Chris Segal - 227 Games (111 in 2014, 116 in 2015). 7) Pat Hoberg - 215 Games (123 in 2014, 92 in 2015). 8) Tom Woodring - 156 Games (102 in 2014, 54 in 2015). 9) Sean Barber - 150 Games (92 in 2014, 58 in 2015). 10) Ben May - 118 Games (30 in 2014, 88 in 2015). 11) Ryan Blakney - 88 Games (88 in 2015). 12) Seth Buckminster - 67 Games (66 in 2014, 1 in 2015). 13) Stu Scheurwater - 47 Games (24 in 2014, 23 in 2015). 14) Carlos Torres - 19 Games (19 in 2015). 15) Chad Whitson - 15 Games (7 in 2014, 8 in 2015). 16) Anthony "A.J." Johnson - 6 Games (1 in 2014, 5 in 2015). 17) Ramon De Jesus - Rookie. 17) Nic Lentz - Rookie. 17) Roberto Ortiz - Rookie. Underlined text indicates that umpire officiated the most regular season games of all 2016 call-ups during the indicated season. Tumpane - 2010, 2011, 2013, 2014. Sabermetric formula, hiring: (Games Worked/1000 + Games in 2015/411)/2.